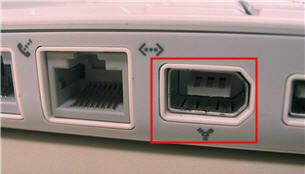 Along with USB, Firewire (also called IEEE 1394) is another popular connector for adding peripherals to your computer. Firewire is most often used to connect digital camcorders, external hard drives, and other devices that can benefit from the high transfer rates (up to 480 Mbps) supported by the Firewire connection. The iSight camera used for chatting on the Mac connects using a Firewire cable. In addition to connecting peripherals such as camcorders or external hard drives, Firewire can be used to connect two computers to transfer files. Firewire has the advantage of being able to transfer power to the device through the same cable that does the data transfer. A disadvantage of Firewire is that cables tend to be more expensive. Firewire was originally developed by Apple and comes standard on many Macintosh computers. Even though most camcorders also include USB 2 connectors, these may only be used to download the digital images many newer camcorders can take. To download video, you would use the Firewire connection. Like USB, Firewire supports different connector types. 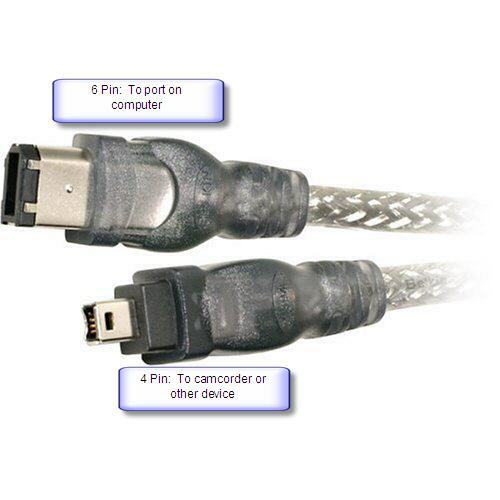 The end of the cable that goes into the computer is a 6 Pin cable, while the smaller connector that goes into the camcorder is a 4 Pin cable. To connect two computers, you will need a 6 Pin to 6 Pin cable.